The Torres del Paine W Trek is the classic. We believe that most trekkers can do it a day less than the the traditional 5 days and still have plenty of time to take photos and fully enjoy the views. Day 2 of the three-day version this trek is a long day, and most suited to fit hikers with light packs. Many may consider breaking Day 2 into two days for a total of four days for a more leisurely W Trek. Our recommendation is to start at Refugio Paine Grande (the west) and work your way back to Hotel Torres (the east). Lead Photo: The Torres Del Paine, the gem of the Trek. Paine means “blue” in the native Tehuelche (Aonikenk) language and torres is tower in Spanish. So Towers of Blue. Note this is a companion piece to an overall guide to Trekking the Torres de Paine. The main post: Torres del Paine Trekking – Quick and Easy Guide to Essential Trip Planning has gear lists, food lists, information on campsite reservations, busses and ferries, park maps, GPX files, and other essential information to plan your trip. Check the bus and ferry schedules to get the most current info (see Transportation). Check in at Basecamp/Erratic Rock for 3:00 talk. (Worth listening to!) You can rent gear at Basecamp and they make a decent pizza. Alcohol fuel is available at Cruz Verde pharmacias in plastic bottles. Today you’ll do a round trip day hike from Refugio Paine Grande (RPG) as far as you can for a good view of Glacier Grey. Back at RPG you’ll don your full pack and trek over to Campamento Italiano or Refugio Frances (to setup for day hiking up Valle Frances the next morning). *Note 1: Hours (hiking times between points) is just that—hiking/moving time only. Our hiking times include only short stopped tasks like tying a shoelace, snapping a quick photo, putting on a rain jacket, or filling a water bottle. They do not include stoppage or breaks longer than 2 minutes. Note 2: don’t forget that it doesn’t get dark until almost 23:00, 11:00 pm in peak hiking season. You have almost 18 hours of daylight! Be first off the bus at Laguna Amarga Entrance stop (around 9:30 am). Pay entrance fee & get permit. If you didn’t make campsite reservations for free campamentos do it now. The free campsites on the W — Campamento Italiano & Torres fill fast. If you can’t get a reservation at C. Italiano, for a small fee camping at the nearby R. Frances is quieter and nicer. Get back on bus and arrive approx. 10:30a at the Pudeto ferry dock (Catamaran on Lago Pehoé). Ferry leaves at 12:00 or 6:00 for Paine Grande. (Realistically in high season it may be going back and forth almost hourly). We got a “10:45” ferry and got to R. Paine Grande around 11:15 am. You pay your fee on the ferry–no advance reservations taken. View from Third mirador (Mirador-Grey-03 on my map): The massive, 4.5 mile wide Glacier Grey as it feeds into Lago Grey. On Day 1 – you’ll hike as far as you have time or energy to get views of the Glacier. The closer you get to the Glacier the better the views, but rest assured there are no bad views! Hike to one of the viewpoints for Glacier Grey: Drop your pack at Refugio Paine Grande (RPG) and setup your day-hiking kit to do a round trip hike to one of the many miradors (viewpoints) for Glacier Grey. Essentially you’ll hike as far as you have time or energy. The closer you get to the Glacier the better the views, but rest assured there are no bad views! First mirador (Mirador-Grey-01 on my map), is on a high bluff overlooking Lago Grey. One way stats: approx. 5.5 km, 3.5 miles and 1.5 to 2.0 hours from RPG. Second mirador (Mirador-Grey-02 on my map) is the mirador for the classic ‘W.’ It is at Refugio Grey, on the shore of Lago Grey looking up at the Glacier. There are many food options at the Refugio. One way stats: approx. 11 km, 6.9 miles and 2.5 to 3.5 hours from RPG. Hike back to Refugio Paine Grande from whatever mirador you stopped at. Pickup your pack and head off to the free camping at Campamento Italiano (if you have a reservation) or possibly camping at Refugio Frances. One way stats to C. Italiano: approx. 7.5 km, 4.8 miles and 2.0 hours from RPG. The new and very nice R Frances about ½ hour down the trail from C. Italiano has nice camping and good tent platforms. Best hot showers and bathrooms of the trip by far. Small store and they serve meals if you have reservations. If you have extra time and the mountains are clear, you might consider hiking up to one of the miradors for views of Glacier Frances. Fair warning, not all days are sunny in Patagonia, but that doesn’t mean the Torres del Paine is any less beautiful. Clouds and mists swirling around the high peaks are every bit as stunning as a sunny day. Glacier Frances (a hanging glacier) from near Mirador Frances. The summit of Paine Grande the highest mountain in the park at 3,050 m (10,000 ft) is is already obscured by clouds mid-afternoon. It’s typical in Patagonia for peaks to cloud in later in the day, even in good weather. Early starts are best if you want unobstructed views of the peaks. This is a long day and one might consider an early start (or breaking it into two days – see 4-day itinerary below). An early start has the added benefit of getting to Mirador Frances with the clearest views since the mountains tend to cloud in as the day progresses, and possibly allowing you time at the end of the day to hike up to see the Torres del Paine. Leave your pack in camp and day hike to at least Mirador Frances for a stunning view of the hanging Glacier Frances. We were less inspired by the hike up Valle Frances to the Mirador Britanico which is a lot more trekking for a nice view of a high cirque. If you are short on time and energy, Mirador Frances is the bigger bang for the buck. Round trip stats for M. Frances: approx. 4 km, 2.6 miles and 2.0 to 2.5 hours. Back at camp, grab your pack and take a very pleasant alpine walk along the shore of Lago Nordenskjöld to Refugio Los Cuernos. One way stats from C. Italiano to R. Cuernos: approx. 5 km, 3.1 miles and 1.5 to 2.0 hours. From R. Cuernos take the cutoff trail to Refugio Chileno (well marked at around 8 km, 5 miles from R Cueros). Refugio Chileno has a very nice store! One way stats from R Cuernos to R Chileno: approx. 18 km, 11.3 miles and 4.0 to 5.0 hours to R. Chileno. Camp here as CONAF’s Campamento Torres is closed to camping. Los Cuernos to Refugio Chileno: Wildflowers in front of the massive Almirante Nieto mountain. On our way to see the Torres del Paine later in the day. Hike to Mirador las Torres. to see the famous Torres del Paine. It is also beneficial to familiarize yourself with the steep trail if you hike it in the dark the next morning to catch the Torres at dawn. One way stats from R. Chileno: approx. 3 km, 2 miles and 1.0 hours to C. Torres. A quick hike to see the Torres at dawn. Then an easy downhill hike to Hotel Torres to catch buses back to Puerto Natales. From Hotel las Torres take the 2:00 (approx. time) park shuttle bus back to the Laguna Amarga Entrance Station. From there you can catch a 2:30 Bus Gomez back to Puerto Natales. This turns Day 2 from a long hard day into two far more leisurely days. It also makes hiking all the way up Valle Frances to Mirador Britanico a far more attractive option. Day 1: Same as Day 1 above. On Day 1 you also have the option of camping at Refugio Paine Grande since the next day is not a killer day. This a) allows your more time to day hike up to miradors for Glacier Grey, or b) makes Day 1 hiking about 2 hours shorter. If camping at RPG make sure to pitch your tent close to the base of the hill to get some shelter from the strong winds that commonly blow in the area. Day 2: Hike as far as you want up Valle Frances (even to Mirador Britanico). Then pickup your pack and hike to camp at Refugio Los Cuernos. Day 3: Hike to R. Chileno and possibly hike up to Mirador Las Torres for an evening view. Day 4: Dawn hike to Mirador Las Torres. Hike to Hotel Las Torres and take buses back to Puerto Natales. This table is a just starting point for planning. You will need to estimate your own hiking pace based on your abilities and pack weight. Times in above table are for Alison and I on our recent trek which we averaged about 2 miles per hour (3.4 km/hr). We are reasonably fit and experienced hikers and carried packs under 18 pounds (under 8 kilos). See our gear list in main post for details. But we are both over 50 years old and by no means speed hikers. And during our trek, Alison was recovering from influenza. Hours (hiking times between points) is just that—hiking/moving time only. Our hiking times include only short stopped tasks like tying a shoelace, snapping a quick photo, putting on a rain jacket, or filling a water bottle. They do not include stoppage or breaks longer than 2-3 minutes. We averaged 2 miles/hour the entire trek. Hiking times on Park Maps and in most guide books are conservative (based on an “average” hiker traveling with a heavy pack and not intending on setting any speed records). If you are reasonably fit hiker you will likely do better than these times. We believe with an early start and decent to OK weather, most backpackers could probably do two stages in a day. You have 17 hours of daylight in January! So chances are that you’ll take less time to get from place to place than their estimates. This is one case where hiking too fast is as problematic as too slow. The major complaint we heard was of people hiking faster than expected and arriving at their reserved campground around noon. e.g. they could have easily hiked another stage that day to the next campamento/refugio. We suggest you get an early start and hike far when the weather is good. You may get bad weather later in the trip. There is a lot of daylight in the summer hiking season. The key to making miles is to keep a steady pace and minimize time lost on long stops. We are 4 hikers wanting to do the W of Torres del Paine during end of November and beginning of December 2019. On the app showing availability, our dates are not there. Is it possible, and necessary to book now for camping on the trail? If not, when do we have to book? We plan to do the hike in 4 days. Great website and thank you for sharing your experiences and knowledge on TdP. I’m researching on TdP and want to visit early Oct 2019. Would most of the refugios be opened and operational during this month? Also, during my research I came across a site stating that from May 1 to September that “guides” will be required for W treks and that we can no longer trek on our own. Is that true? Do you have any clarity on this matter? Thanks for clarifying and providing the details. After revisiting the site, I feel it was referring to the “low” season on guide requirement. However, I will double check to be sure. I’m looking at using the itinerary you provided and travelling from West to East and wondering if there were any storing facility near Laguna Amarga for the bulk of my luggage? I am looking at taking what I need for the 4 days hike and a day pack. I would prefer to head from Laguna Amarga to El Calafate rather than back tracking to Puerto Natales, which means an extra day. I’ve done some research and it is possible, however, just concerned on the bulk of my luggage. Also, would you suggest booking the accommodation first and then the transportation? Just concerned of the limited refugios. Thanks for clarifying that. I will check again as suggested. Would you know if La Amarga has any luggage storage facility? As my next destination is El Calafate, I was hoping to depart from La Amarga instead of back-tracking to Puerto Natales. I would like to keep the bulk of my luggage here and take with me the necessities for the 4 days hike and a day pack. Just back from a trip to South America, can’t begin to thank you enough for the great information here! Could only manage two nights in Torres so your guide was immensely useful for fitting the whole W into that tight time-frame. It wasn’t easy but was able to get to Grey Glacier and Britanico Miradors with just enough time to get to the refugios in time for dinner! Hi Alan, thanks for all this information! My friend and I will be hiking for three days mid-March. We were able to reserve a spot at Campamento Italiano for the first night, but are unable to find out how to get a reservation for Campamento Torres. Any suggestions on the best way to do this? Thanks! Hope this helps. And if you need more info and specifics for the Trek it will likely be in our Guide. We believe it is the most accurate and comprehensive Guide to Torres del Paine out there. Wishing you a great trek. Warmest, -alan & alison. Thanks so much for the wealth of information. My friends and I are planning on doing the W Trek in May. However, the websites booking end on April 30. How do you suggest we book the campgrounds? Or would we get away with hiking the trek without booking the campgrounds? Hi Jeremy, nice to hear from you. I believe that most of the information you ask for is already in the Guide. But I have excerpted the following for you. So no you don’t need to book a campground for the W, but there will be no services. And of course the weather likely be colder, possibly be a lot colder. In conjunction with Patagonian winds these can be challenging hiking/camping conditions. Your tent, gear, clothing and cold weather camping skills should be up to the task. Wishing you a great trek. Warmest, -alan & alison. Hi Alan – thanks again for all the great info – I’m having trouble locating the process for making dinner reservations – we will be staying at camping central, Domo Francés, and Paine Grande. Any help would be appreciated – thanks!! I did book and selected full board for all, but it didn’t give me the option to choose a reservation time? Greetings, Our tentative itinerary has us going from Paine Grande with a RT hike to Mirador Britannico and then on to camping at Refugio Francis. Can we stash our heavier packs at Italiano during our up and back to Mirador Britannico even though we are not planning to camp there? I wasn’t sure how that worked exaclty. Thanks so much for your website. We are planning our trip to to Torres del Paine for late December 2019. We plan to do 5 days/4 nights. Hi Heidi, we did the same last year. Just to mention when Alan says ‘around the hut’ it was exactly that – we just left them on the ground outside, there’s no actual storage facility. So I would cover your pack securely to protect it from weather and as Alan said take valuables with you just in case. Enjoy your trip it’s a really amazing place. Hi Alan, great site and a wealth of info. I Would like some feedback and your opinion on the new time hacks for trekking the W.
We have a trip booked hiking west to east and just read about the time requirements for getting off the trail. Perhaps you can help me understand. Brian, not really sure I can completely answer this Question. Yes, there is some time enforcement on the route. We have had hikers report being turned back when hiking to Seron. And we saw it in action for people hiking up too late in the day to reach the Torres del Paine. Since we were never turned back and were not privy to the conversation between the hikers and the ranger I can’t answer how strict they would be. And we do know that the park is strict on having reservations and sticking to a schedule as well. This all makes sense since TdP is a heavily used park that is generally at capacity, and has a large number of inexperienced day hikers and backpackers. As such, there needs to be some measure of enforcement of rules that are in the best interest of the park, and individual hikers. Otherwise, lost hikers, and park damage, and general chaos could easily become a problem. Thanks for your inputs. We have reservations at every Refugio, just wanted to relax and take our time but now we know that is not an option. 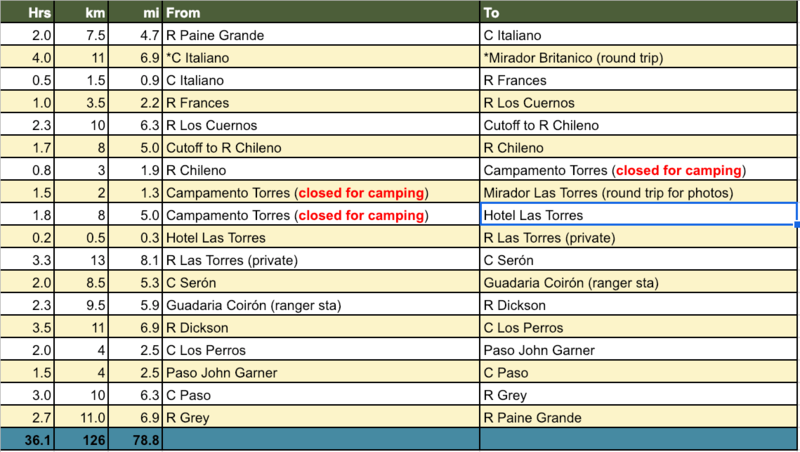 Hi Alan – the table on this page “Torres del Paine Time and Mileage Table : Alison’s & Alan’s hiking times” seems to be identical to the table for the O trek. Do you have a different table for the W trek? Thanks!! Thanks so much, definitely the most informative blog by far! We will be doing the Moreno glacier near El Calafate and are quite limited on time, so thinking we could exclude the Grey hike. 1. January 15th: 7am bus from PN to TdP. Cross Lake Pehoe and leave bags at Italiano to hike the full French Valley. Or would you recommend fitting in an extra night at Paine Grande? We are fit and not afraid of longer treks. Hi Jane! First I would say that the 3 days that Alison and I did is fairly aggressive (but certainly doable) schedule for fit backpackers carrying ultralight packs. But unless you are seasoned backpackers 4 days might be a more prudent guess. Also complicating things is the closure of Campamento Torres, leaving Campamento Chileno (Área de acampar Chileno) the only game in town to camp at before hiking up to the Torres del Paine… But without knowing your fitness, how light your packs are, how fast you hike with a pack on, and/or your % of time stopped vs. actually hiking during the day; I can’t even begin to hazard a guess as tp whether you can or can not do the itinerary you have planned. As to a great training regimen and to figure out how far you’ll hike each day… look no further than my highly regarded (and highly ranked) Quick and Efficient Training for Backpacking and Hiking. It will get you in great shape for the TdP. And will give you good info to estimate how far you’ll be able to hike each day. As to the Q “can I do the trek in x amount of time? :” scan through the comments on the main guide. I’ve answered this Q more extensively many times–you’ll likely to find one of the detailed answers for sure. But in summary, you’ll need to determine that for yourself on long day hikes carrying the amount of weight you intend to carry on the Trek. And you’ll need to know how efficient you are. I.e. how much time you spend walking vs. how much time stopped. Also note that you’ll usually take an additional loss in hiking speed (vs. your training day hikes) when on a real multi-day backpacking trip. And you might want to add one (or two for the Circuit Trek) possible weather delay days into your trek. (And in particular for those doing the Circuit Trek, Paso John Gardiner is always a possible no-go based on winds and or whiteout conditions.) But even some of the best views on the W might be rained or clouded in some days. If there any way to get elevation gain information for your 3-4 day itinerary? Trying to judge how difficult these hikes are :) Thank you!!! Thanks for the great information. Why do you suggest traveling the W circuit west to east instead of east to west (starting at Central Sector)? Thanks, for the super thorough and helpful guides! and gave the online form a shot one more time yesterday before trying to book via email, and it worked. So seems like the big may have been fixed. Alan, great info, planning final details for Thanksgiving week. Your thought? Thanks Alan, we been able to reserve via email with Fantastico Sur, so far pretty smooth to reserve camping cuernos and camping chileno with them. Hi, we recently did the W trek at the end of March and this website was really helpful to us planning it, so thanks again! Day 2: Paine Grande to *not quite* mirador Britanico & back, camp at Los Cuernos. Day 3: Cuernos to Las Torres & back to camp at Chileno. Day 4: Back down from Chileno to Hotel Las Torres, bus to Laguna Amarga gate, bus back to Pudeto to our car. – The obvious route from Puerto Natales is the 290 turning towards Cueva Milodon. This was closed so the journey took longer than expected – we allowed 3 hours from PN to the 9am ferry at Pudeto and only just made it. Google suggests it might have just reopened now very recently? – Paine Grande camp is very exposed. Our tent was all pegged down and a gust of wind flipped it right over like a paper plate! The ground was so soft the pegs got ripped right out. Put large rocks on top of your pegs all round even it’s not windy. – The trail is almost entirely well marked, but we lost it near the end of the leg to Britanico and several others did too. The trail is pretty much through woodland all the way and sometimes splits into a few well trodden paths. At about 2.5 miles you come to a significant break in the woodland. Don’t go up the valley to the right, apparently the trail should cross the stream and go back into the woods ahead. We started going up the valley and it was very sketchy. Doesn’t look that bad and very beautiful, but the ground is extremely soft with large boulders easily dislodged. Nearly got hit by one from people ahead. Add to that crazy gusts of wind which literally knocked me flat a couple of times and it was getting pretty serious. – We were told buses from Laguna Amarga to Pudeto only went at 9:30 and 16:00-16:30 by several different people including a guard at Laguna Amarga itself. But one turned up at 1:30 too, bonus! Our trek was part of an amazing roadtrip, basically routes 40 (Arg) and 7 (Chile) between Bariloche and Puerto Natales, so feel free to try me if you have questions about places on those routes! I cannot tell you how helpful this site has been for me. My husband and I just got back from TDP using your 3/4 day plan to hike the W, and it was amazing. Especially helpful were your descriptors of the little details (like hopping back onto the bus after entering the park, where to drop our packs, etc) and the different site closures for the season. We camped at Chileno the night before hiking up to the towers (Camp Torres was closed, as you mentioned) and your time estimates were essential for us to make it up before sunrise. Thank you! Our long distance hike time were just a little slower than your estimates (we’re not ultra-lighters! ), but much, much quicker than the ranger map. Again, thank you for this post and happy travels! Very much appreciate you doing this work and keeping it going. What a gift! I walked the W 11 years ago. We stayed at the Refugios and the Hotel, opting out of camping. I see you tend to camp rather than stay at the Refugios. Do you have any leads on how to reserve said and how you would vary your recommended walk staying in beds rather than camping? I didn’t organize our walk originally and now want to do the walk again, having lost my dear navigator/planner am trying to reconstruct! I haven’t had much luck trying to find the source for booking at this point. Thank you for your love of the region and sharing your experiences and good thoughts! Its great to read all the information on your website, we didn’t think it was possible but we even got more exited than we already were. At this moment I am planning a hike for me and a friend. It would be great if you could help us with the following schedule. On February 25th we arrive in El Calafate and if possible we would like to take a bus on that same day to refugio Torre Norte for and stay there from 25-02-2018 untill 27-02-2018. we dont know yet if there is something available so are there any other option to stay overnight? On February 26th we would like to hike to Mirador base de las Torre and back to the refugio/accomodation. On February 27th we would like to hike to Refugio y área de acampar Los Cuernos and stay there for one night between 27-02-2017 and 28-02-2018. Again we dont know yet of they have any availability. are there any other options? On 28-02-2018 we continue our hike to uardería Paine Grande and take the boat to Cafetería Pudeto. Do you know where we can book a ticket for this boat? – Is there any other accomodation than the refugios available? and where can we book them. – How can I book a ticket for the boat to Cafetería Pudeto? And maybe the most important question: we consider ourselfs as quite athletic because of all the sport we do but we are not experienced hikers. Do you think we manage? We would really appriciate it if you could help us. Glad you found the site helpful. And yes, you should be excited. TdP is a magic place! As to your Qs, please read the beginning of my main Trip Guide (Torres del Paine W Trek and Circuit Trek – Quick and Easy Guide to Essential Trip Planning).. It has all the info. you are asking about including lodging options, how to book them, busses and ferries. Finally getting your packweight down will certainly help cover more miles each, and possibly more important make the hiking easier and more fun! See my Gear List for some ideas on how to get your weight down but still be warm, comfortable and safe! Finally, note that this is a self-help trip guide, meant to assist people to plan and execute their trips — not not plan it for them. While we love to help people, unfortunately we just don’t have the time to be an on-demand research service for all the Q’s people on this site (many of which are answered in detail in the guide anyway). And we aren’t a booking agency. So most importantly, we have no special access to V, FS & CONAF. As such, your best strategy is to deal directly with V, FS & CONAF yourself. My husband and I are in chile 20 Dec – 20 Jan 18, roughly and are very keen to do the W at the end of our trip ie 10-15 Jan. I was looking at your 4 day guide and wanted yo book campsites with tent/sleeping bag provided or bunk beds or refugee or whatever… And want to have the luxury of sopping to photograph and thoroughly absorb the beauty of the environs… So, I’d be very grateful if you could advise me on night stops that are book able for 4 nights/5 days? Huge gratitude winging its way to you from Bristol UK. Apologies for the late reply. I took some time off during Thanksgiving to be with family. I’m glad you’re excited about doing the W trek, it’s wonderful! Thanks so much for this, this was extremely clear and helpful. GIven the limited time we will have in that area, we will do exactly that 3 day circuit One question though: In the end you mention there is a park shuttle from Torres to Laguna Amarga. Can you / do you need reserve seats for that one too? Or how do you get tickets? Do you know maybe what time i can eat Breakfast at most od Campsite from Fantastico. Becouse I want start as early as you. I try to do exactly this same but becouse Italiano is full booking I Put instead sector francis and instead of sector Chileno I Put sector central . Did you eat something at refugio during Your way or all Your food have with you . I’ll carry my own tent , and in your post couple times you said that I should leave my heavy backpack ( for example in refugio Paine Grande in way to Glacier Grey and in camp Italiano during my way to Mirador Frances ) and just take daypack with me and in way back I can collect this heavy again. Where can I leave those heavy one, should I set my tent and Put inside or is special pleace for hikiers. I have got 6 full day there : in Your opinion I should share those W Trek at 4 and 1 spend in Natales. Are you able to say something about Otway Sound – pinguins in way from Natales to Arenas. Can I do by myself . As to the packs, folks just normally leave them around the ranger station at C. Italiano. Just make sure you get all your high value stuff like, wallet, passport, camera, phone etc. into your day pack. Me and my brother are trying to book something, but I’m realising now that we are obviously a bit late for the party. If acampamento Chileno is fully booked around the dates we could possibly do it, do you believe we have any other option? The idea was booking Campamento Frances for the first night but we can’t get a spot for the second night.. is it feasible going for coming for a second night in the same place after doing Torres? Or even, is it feasible doing a really tough second day and going away on the second day? Hi David, that sounds like a lovely trek. That is, assuming that you can comfortably hike those distances each day and enjoy yourself. it is certainly a doable schedule for fit backpackers carrying ultralight packs. Complicating things a bit is the closure of Campamento Torres, leaving Campamento Chileno (Área de acampar Chileno) the only game in town to camp at before hiking up to the Torres del Paine. I would recommend booking early at Chileno! I consider myself a fairly fit hiker, but I don’t want to rush things up in this one. I really thought this itinerary isn’t that difficult, guess I was wrong. Do you have any suggestion to make things a little easier (4-5 days) without the free camps (since they are already fully booked)? Thanks for a fantastic website. One question: is your 3 day itinerary doable for a good hiker, but with a backpack? Does it leave room to see landscapes? Or would that be a stretch? Your site is so so so helpful! Thank you! Do you know if a double platform +FB at Chileno is for 2 people or 4? Thanks again! Thanks so much for this site Alan! It’s incredibly helpful to find all this info in one place. Day 1: Hike an easy 6.9 miles to Refugio Grey, camp there, and check out the glacier. Day 2: Hike 11.6 miles to Italiano, drop packs there, and do the 6.9 mile round trip to the mirador. Spend the night at Italiano. Day 3: Hike 14.4 miles to Chileno. If we get there early enough and have the energy, drop our packs and do the 3.2 mile round trip to check out the Torres. Day 4: Get up predawn, check out the Torres at sunrise, and then hike the 3.1 miles from Chileno to the exit. Does that make sense? Are there any drawbacks that I’m missing? Thanks so much! Well done! Sure am glad I ran into your post. Went a couple years ago and I “winged” it without reservations and was perfectly fine. Going back at the end of the year and planned on doing the same. I might want to rethink that now. :) Wish I had this detailed of a post prior to my first trip, very well put together. Hi Alan- I am planning on a trip in November 2017 and I have to say your website is fantastic! I was having some issue booking campsites/refugios through the websites. I wanted to ask if the sites typically fill up 6 months in advance or the companies that run them don’t take reservations this far in advance? I didn’t want to book a plane ticket I know that I won’t have a place to stay for the route. Hi Alan – thanks for posting so much information! I just started planning my trip for December 2017 and your website is well awesome. I have a question about leaving your packs at refugios where you are not staying the night, RPG, for example. Do they have a designated area to leave packs? Is there any fee associated with this (ie if someone is watching them)? I’m just curious how that whole process would work. As to leaving stuff at a Refugios: Most hikers just leave their stuff in a fairly high traffic area, e.g. on the side of the Ranger’s hut at Campamento Italiano–you might see upwards of 50 packs piled there as folks trek on up into Valley Frances. Thank you so much for your website! It has all the info you want to know but can’t find on the internet. Me and 2 of my friends are leaving at the end of the week for Torres del Paine. This whole trip was sort of last minute and we’ll only have 3 days/2 nights in the park. We’re all young (21 yo) and pretty fit but most of all very dedicated to seeing both Glacier Grey and the Torres while we’re there. Our current plan is to hike west to east, starting on Day 1 with a bus from Puerto Natales for the noon ferry. Then, we plan to hike up to the Glacier Grey mirador, admire the view for a hot sec and snap a few picks. Then we will hike back down and camp overnight at Paine Grande. On Day 2, we will get a very early start to reach Torres Norte, where we’ll camp overnight. On Day 3, we will hike up to the Torres, then back down for the bus to Puerto Natales. So…I just had a few questions that I was hoping you could answer, as someone who knows the park. (1) Since days are not super long at the end of April, we will end up reaching the campsite at Paine Grande in the dark on Day 1. Are the trails marked clearly enough for this to work? (2) Also, just wondering if you had any thoughts on completing the Paine Grande to Torres Norte in one day? We realize it would be a very long day but we just really want to see the glacier and Torres! Thank you very much for any insight you have! If you are young and fast (and efficient!) hikers this should work. I am on the road, with limited internet so can’t write long messages. As to timing and distance, you should check the Main Post’s Message Thread for my other responses as to timing vs. your KNOWN hiking pace. It also points you to a post of mine on how to hike efficiency. (Note: feedbaack is that most people fall somewhere between my hiking times and the Park’s estimated times). Trails are well signed. Make sure you take the shortcut to Campamento Torres to save some time and distance! My other recommendations would be to get very early starts, don’t take unnecessary stops, and keep close track during the day of how you are doing with hiking times vs. distance. Then adapt your plan/approach if you aren’t making the necessary speed. Enjoy TdP! Hi Alan – thank you for this guide. I’m going to be hiking the W in late April, and came across an app with offline trail maps – here: https://appadvice.com/app/torres-del-paine-map/545998465. Have you heard of this or do you know if it is reputable? I’ve also been researching what would be the most affordable emergency 2-way communication device to take on the trail – do you have any suggestions? Most of the options I have looked at are quite pricey. 1) yes, by the time you add in a plan none of these devices is cheap. I have done some really good writing and reviews about them tho. See Why you should make a trip plan (and you should!). And Best Sat. Messenger inReach vs. SPOT. Note that depending on how much you use your unit, the annual service plan for the SPOT may or may not be less expensive than the as-needed Freedom Plan for the inReach. 2) App looks nice, I’ll need to check it out. If it works in the field with no mobile data (and without burning a lot a battery) that’s great. At $3 it would certainly be a bargain. Please report back on how it works. If you are finding that all the campsites and refugios are filled, don’t give up hope. It seems that Fantastico Sur can work it out even if their website says they are full. I’m going in February 2017. Just when I was about to give up on my trip because everything was reserved, I reached out to Fantastico Sur if they had any unguided tour packages available — and they did! Nice work! Glad you have your reservations all worked out. Did you call or email Fantastico Sur for the unguided tour? I have reservations at Chileno, Central, then RPG ( we are doing East to West) But I dont have a reservation at Cuernos. If I cant get a site in that area then I have a 20+ mile hike in one day, which is damn near impossible!. Any suggestions? CONAF sites appear booked up too, online anyway. Hey there! My fiance and I are looking into Patagonia and Torres Del Paine for our honeymoon, and we’re still in the research stage. Your blog has been super helpful on how the W can be done and what we should do. Quick question – if we didn’t want to camp, and wanted to stay at refugios instead, are they along the whole way? Is it possible to only stay at refugios? Thanks so much! Hi, im planing to hike torres del paine in January and I just started to book campsites so a lot of them are already sold out. Las torres campsite is sold out so I was thinking about sleeping at el chileno but apparently I HAVE to pay for meals too even if Im camping so it would cost 90 usd. It is a bit expensive so I was thinking that I could sleep at Central camping (close to the hotel) cause it is only 15$ usd. If I choose that option, Im gonna have a long walk to do before getting to las torres mirador so I feel like im not gonna be able to get there for the sunrise. Is it really worth it to see the sun rise or would i be ok arriving a bit later in the morning? I think i could see the sunrise if I slept at el chileno but I would have to pay 65 usd more only to see a sunrise. What do you think? We saw tons of people doing the day-hike from the Hotel to the Towers and back. Definitely doable. And the towers are great at any time of day. The main downside of getting there late in the day is that clouds are more likely to build and obscure the towers. But with a pre-dawn start from the Hotel you could still be at the towers fairly early in the day. The other downsides are a) it’s more crowded later in the day, and b) you miss seeing them glowing red in the AM. But the latter is a rare’ish event that depends on particular conditions to happen. Apparently the red towers event is more common in Oct November when there are less clouds along the coast at dawn. This allows the long (very red) and early rays to sunlight to reach the towers. This is what every photographer hopes for, but is not assured by any means. THANK YOU SO MUCH!!! I was beginning to experience major anxiety about this hiking trip and now I am thinking that it is going to be very doable. I’m taking my daughter on her first backpacking experience. She is young, but I think we will take breaks and take our time. We will probably not hike in as far into the “w” when we have the option to make it shorter for her sake. All of the campsites are booked at the end of the W though. I’m not sure what to do. There is one campsite available with the private company for $180!! Eek! Teresa, glad you found the Guide useful. As to your camping option, I am about 99% sure that $180 is for a cabin or room and not a campsite. We paid around $10-$20 for private campsites along the route. Which end of the W are you talking about? There are private Campamentos at Refugio Grey, Refugio Paine Grande, and Camping Las Torres near Hotel Las Torres (this is not the same as the Park run Campamento Torres). Vertice Patagonia handles reservations for: Refugio Paine Grande (camping, meals & beds), R. Grey (camping, meals & beds), R. Dickson (camping, meals & beds), and Camping Los Perros (camping only). November 2016. New requirements for reservations and route quotas for both the W Trek and Circuit Trek. Until I manage to update all the TdP Guide Pages, this information supersedes what’s written in them. There is a 80 person per day limit for the “Backside” (non-W portion) of the Circuit Trek. This is passively regulated by the campsite reservation system (that is, if you have all your campsite reservations you are part of the 80 people per day allowed). This is being enforced. There is a guard house on the backside operated by CONAF and and you’ll be asked to show proof of your reservations to proceed. Thanks so much for all of the great information. Very helpful! We will have a rental car. Is it possible to drive from Puerto Natales to Torres del Paine and then leave the car at the park entrance or at the ferry? Once we complete our trek, we are driving to El Chalten and we wondered if having the car in TdP would save some time? Mike, Alison and I did not use a car for the almost 3 weeks we were in Chile. I think one option would be to leave your car in Puerto Natales and take the bus from there. If you feel like you want it watched a bit you might make an agreement with your hotel to keep an eye on it while you are in TdP. Alan, Thank you so much, your blog is indispensable!!! My husband and I plus another couple (all in the 50s) are heading to the area i February. We are wondering if it would be just as good to do the W in the opposite direction and why most people seem to go the way you suggested. Do you happen to know? A travel agent advised us to reverse the trip. I think most people do it in the direction we did because it gives you the option of “day hiking out” to Glacier Grey and back on Day 1 — and still be able to camp at Italiano of the first day. So glad to have found your site! I’ve been burning the midnight oil taking it all in. Thank you, thank you, thank you! We’re trying to decide which itinerary to do for our time and abilities – the limiting factors are that husband got a new knee in March, and son broke his ankle/lower leg climbing in April and neither are sure how they’ll feel by the end of 80 miles of the O. We’re flying into Buenos Aires on Dec 15 and planning on incorporating TDP along with Los Glaciares/Mont. Fitz Roy, Perito Moreno Glacier, and possibly Bariloche in the North. We fly back out of BA three weeks later. Did you end up going anywhere else in Patagonia? If so, do you have any recommendations to help us prioritize? Do you have any idea if being there over Christmas and New Years will be a problem? Thanks again! Kelly, so glad you found the guide useful. And yes TdP and Los Glaciares/Mont. Fitz Roy, Perito Moreno Glacier would be the grand tour of Patagonia! As to the W vs. O I can make a few suggestions, but not being you, your son, or your husband they can only be loose suggestions–final call is with you guys. In that vein, consider doing the W as test. By the end of the W you should have a much better idea of the suitability of continuing on to do the rest of the route to complete the O. Although you won’t have a huge selection, the small store at the Hotel at the end of the W should be sufficient to supplement your food if you decide to continue on the O. You can certainly get pasta, sauce and cheese for a few dinners and there is plenty of snack food. The other suggestion would be to do a longish W and trek, by starting with a hike up above Lago Grey for great views of Glacier Grey and the super fun swing bridges. Then continue on to do the W. You could stay overnight at Refugio Grey and do a day hike up above the glacier. That might be the biggest bang for the buck. This is great information. Most blogs I have seen on the W Circuit are written by people in their 20s or 30s. By the time I get to this park, I’ll be 50. I really appreciate your perspective and advice. It’s much more applicable to me.